…and I’m sure the neighbors are wondering just what the heck happened to my trees. I waited until well after dark before applying the final coat though, because along with it I applied the harshest measure I’ve yet taken in my orchard: an organic insecticide. A little extra chemical persuasion that shouldn’t be applied while bees are flying. I felt furtive, and a little bit like I was stepping over to the Dark Side, but watched with glee as a few oriental fruit moths fell out of the leaves and died on the ground in front of me. Gotcha, suckers. And then I went inside and struggled with guilt over the possibility that my peach-defense might end up harming beneficials – organic or not, insecticide is insecticide, and so very far from my previous gentler strategies (as per recommendations in Michael Phillips’ The Holistic Orchard). Josh says I worry too much about bugs, and should think of all the jam and pies instead. I’m trying not to get my hopes up too high that this might – just might – be the first year we get any fruit. 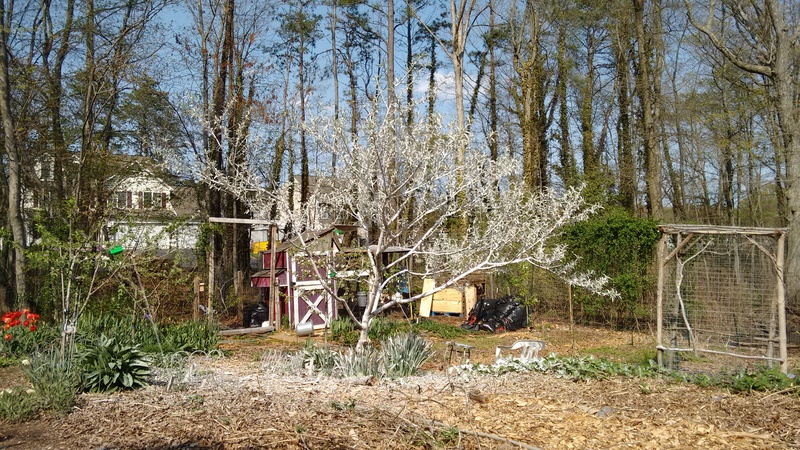 This entry was posted on Saturday, April 25th, 2015 at 4:45 pm	and is filed under garden & farm, food, homesteading. You can follow any responses to this entry through the RSS 2.0 feed. You can leave a response, or trackback from your own site. Atom, Entries (RSS .92), (RSS 2.0) and Comments (RSS 2.0). 26 queries. 0.235 seconds. Top.